It is with great pleasure that I recommend Peter Walker for his craftsmanship. Peter was commissioned to build a large jarrah unit for our home. He spent a great deal of time sourcing the timber, including finding a piece of old jarrah timber from which he could craft a top of almost 6 metres in length, designing the piece, in constant collaboration with us, and getting everything perfect. The final product is truly magnificent. Peter takes enormous pride in his work and it is reflected in the pieces he produces. I highly recommend him to anyone who wants beautiful bespoke furniture. 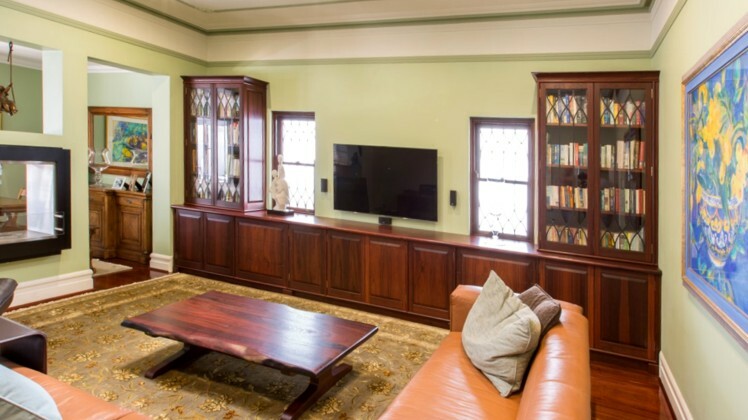 We are absolutely thrilled with the Entertainment and Liquor cabinets that you built for us in American Oak. Having considerable wood working experience myself I could appreciate the traditional joinery techniques and the minute attention to detail that created such superb results. These cabinets are the features of our family room and formal lounge, in the new home we have just completed. Inevitably when friends arrive to visit for the the first time, it is our custom built beautiful cabinets that draws their attention. I hope that in the near future, Peter will construct a 3.1 metre timber dining table in matching oak to grace our formal dining area. In a time when true craftsmen in timber are rare, I consider myself fortunate to have made the connection with Peter Walker. The Blackbutt hexagonal table you have designed and built to suit my smoke glass table top is truly a magnificent piece of art which has now brightened our home. We are so grateful to have found you and your workmanship is a true wonder to behold I can’t thank you enough; I will also be getting you to do another project in the near future for our balcony. Just wanted to say thanks for doing such a terrific job on my kitchen benchtop and making the offcuts into the daybed. Both have been a huge success, with the daybed getting a lot of use, and there is so much space inside which was exactly what we needed. Both jobs surpassed our expectations and look amazing, with the finish on the kitchen feature bench a huge improvement on what we had before. Thanks again for your assistance and I look forward to working with you again in the near future on some pieces for the dining room and entry. Mark & Nina, Perth, W.A. …the helmet [plinth] was a massive hit, it looked fantastic. We are forever grateful to you, you are truly a master at what you do.